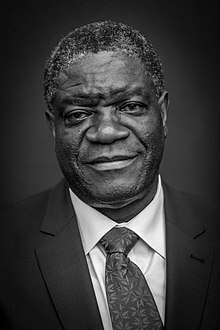 Denis Mukengere Mukwege (/mᵿkˈweɪɡi/; born 1 Mairch 1955) is a Congolese gynecologist. In 2018, Mukwege an Nadia Murad war jyntly awairdit the Nobel Peace Prize for "thair efforts tae end the uise o sexual veeolence as a wappen o war an airmed conflict." ↑ "Denis Mukwege: winner of Sakharov Prize 2014". European Parliament/News. 21 October 2014. Retrieved 22 October 2014. ↑ "Denis Mukwege, Laureate of the 2013 Prize for conflict prevention". Fondation Chirac. 10 October 2013. Retrieved 22 October 2014. This page wis last eeditit on 6 October 2018, at 21:52.